We all waited for this one with bated breath. Who wouldn’t? For starters it has ace Neeraj Pandey who already stole our hearts with thrillers like A Wednesday and Special 26, so technically Baby qualifies as his hattrick in bowling and stumping our hearts away. Then there is the fantastic Akshay Kumar who has proved time and again that he is much beyond his ‘action hero’ tag. To add to this is the fantastic supporting star cast that boasts of stars like Danny Denzongpa, Anupam Kher, Tapsee Pannu, Rana Daggubati, Sushant Singh, Rasheed Naz and Kay Kay Menon. What can possibly go wrong with this one, we wondered. Unfortunately, there are a few misses with this one. A top secret team with a mission to save India from terrorist attacks after 26/11 is born. The mission is named Baby. The team is lead by Ajay (Akshay Kumar), who seems like both the brain and the muscle of the entire project. Akshay is extremely believable as a man who is only focused on protecting his nation and he does a swell job playing Ajay. His straight faced humour and consistent efforts to come up with new excuses before his wife, keep us engaged. Anupan Kher as the smart strategist Shuklaji is terrific. Tapsee Pannu has a very small role, but she delivers oodles of talent in a particular sequence in a hotel room where in she has an encounter with a suspect. Danny plays Akshay’s boss named Feroz Ali Khan. Unfortunately we only see him pacing restlessly in corridors and staring in to nothingness, while the hero is jumping from one place to another to end terrorism. Rana is okay. Kay Kay Menon is impressing as usual. So then what is wrong with the film, if the performances are this good? It is the story. There are some honest to goodness action sequences and scenes that will bring you at the edge of your seat with serious tension. The problem is there are too many references to 26/11, Osama-bin-Laden and all that. Kay Kay Menon is a terrorist who manages to escape from the police in broad day light from a place like marine drive in Mumbai. Now how unbelievable is that? Also, at times there is a lot of patriotic jingoism in the film that could have been easily avoided. We have seen loads of those in films from the 90s, we don’t really expect that out of a Neeraj Pandey film. The film has targeted and raised questions on very serious issues, but then it has provided such easy, convenient answers to most of these, that it is really difficult to digest. The action of the film is quite fast paced and brisk and the dialogues are smart and witty. They do really take the film notches higher in terms of the effect. All in all it isn’t a bad film, but there sure are loopholes that we saw from time to time. OUR VERDICT: Watch it for the performances and the thrills and ignore the loopholes. 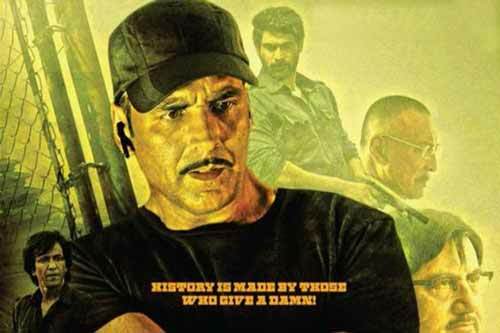 CAST: Akshay Kumar, Danny Denzongpa, Anupam Kher, Tapsee Pannu, Rana Daggubati, Sushant Singh, Rasheed Naz and Kay Kay Menon.